Beyond the story and mythology of the saga, one of the most fascinating things about Star Wars is the behind the scenes stories, especially the big "what if" scenarios. Return Of The Jedi was nearly "Revenge Of The Jedi", Leonardo DiCaprio almost being cast as Anakin Skywalker, and many others. Now we have another one to add to the history books. 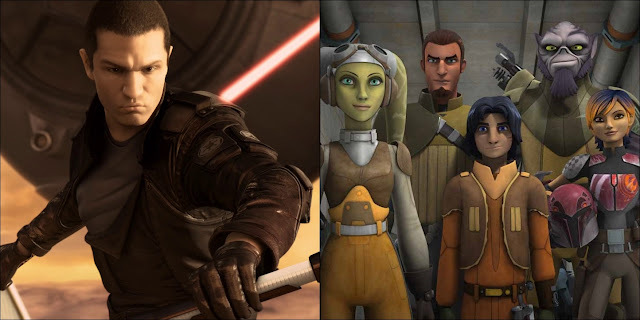 Sam Witwer is an actor who is well known to fans as the voice of many different characters in recent years, including The Son, Darth Maul, Emperor Palpatine, and many others in Star Wars: The Clone Wars and Star Wars Rebels. But it was perhaps his first role as Darth Vader's secret apprentice "Starkiller", a.k.a Galen Marek, in The Force Unleashed video game series that made the biggest splash in Star Wars. "Dave did share with me, by the way, that he considered making Starkiller an Inquisitor in Star Wars Rebels. It didn't quite fit the story that they were telling, but he did think about." This comment is particularly interesting considering that Starkiller, as we know him from The Force Unleashed I and II, is a Legends character. The reorganization of continuity back in 2014 rendered the game non-canon, and Rebels effectively overwrote the game's origin story for the Rebel Alliance. We can assume having to meld with the canon story would have made Starkiller significantly differently, but it still would have been a great surprise for fans of The Force Unleashed. At the end of the day I think this just reaffirms that fact that Lucasfilm never throws a good idea away, and that anything is possible. Lucasfilm may never throw a good idea away but Disney isn't known for good ideas, just taking other people's work and reworking it for their own means. Think anything by Hans Christian Anderson. I thought that taking Force Unleashed out of canon, though Lucas himself said it was, was a giant F.U. to fans. Just as cancelling The Clone Wars was. So much was left unfinished and rebels is as exciting as all the other water-down Disney cartoons I'm tired over this forced-diversity at the sake of a good story mantra that Disney has. I love strong characters, male or female, black or white. I don't care about species either. But, they need a good story otherwise you are doing diversity a disservice. Stop ruining the franchise Disney, stop trying to rewrite history. And stop using the classics and rework them into supposedly original material. Yes, I'm talking about TFU. At least Rogue One was an original star wars story (original, but based on comments from the original movie) Selling to Disney seems like a mistake. I'm not talking about financial game, I'm talking about the integrity of the franchise.